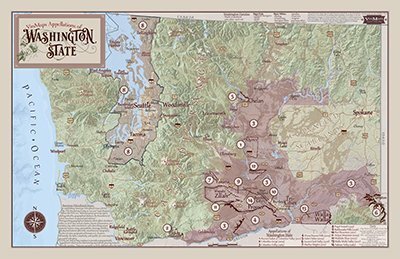 Recently, VinMaps’ cartographer was given the honor of creating an elegant, one-of-a-kind custom wine map for the award winning winery, Ruffino. 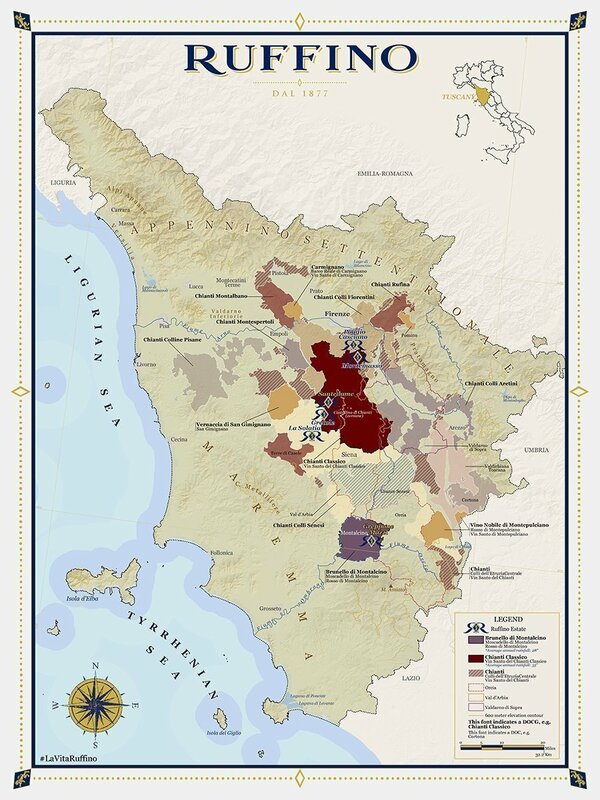 Ruffino’s PR firm, R\WEST, requested a new Tuscany map to use specifically for promoting Ruffino’s Tuscany estates and the Tuscany wine region itself, highlighting areas relevant to specific wines in the promotion. Rather than using a more abstract/decorative map as they have used in the past, they wanted a “real map” that while still being very attractive, would also show the landscape where the grapes are grown, as well as providing an educational aspect. This smaller, poster-sized map was created for their clientele and is both informative and frame-worthy. The DOCG(s) that are very important for these wines are Chianti Classico and Brunello di Montalcino so these particular DOCG boundaries were high lighted on the map. Other DOC/Gs were included as well per the focus area, in and around Firenze, Siena, and Montalcino. Tuscany itself has many other DOC/G(s) but the decision was made to keep the map as uncluttered and specific to the promotional area as possible. Poggio Casciano, Montemasso, Santedame, Gretole, La Solatia, and Greppone Mazzi.